Did the time change totally throw you? Sunday mornings are slightly busy around my house – getting up, feeding The Cat, trying to squeeze in a little exercise, making breakfast, watching my BFF Pioneer Woman on Food Network, getting ready for church, and actually physically get to the car to go to church. Like I said, we’re slightly busy. Throw in a time change and things get crazy. But we got to church on time (victory!). With my body still in early morning rotation mode, I woke up in time to whip up a hearty breakfast for my parents before the morning craziness got started. A quick scan of the fridge revealed half a can of pureed pumpkin that was begging to be used. So I whipped up some pumpkin pancakes – a perfect Fall dish for a Spring (ahead) day! The dry ingredients are simple. Flour, sugar, baking powder, salt, cinnamon, and nutmeg. The wet ingredients are just as simple. Skim milk, an egg, and the pureed pumpkin. What I love about pancakes are their simplicity. Just add wet to dry and mix carefully to JUST combine everything together. Stir in some vanilla extract and some melted butter. And plunk your batter onto a hot griddle. My mom and I decided to play off our Pumpkin Chocolate Chip muffin recipe and add in some mini chocolate chips. This is totally optional, but it added a little sugar to get us moving. Plus, pumpkin and chocolate = BFFs. All that’s left is to serve them up with a drizzle (okay, maybe a small river) of pancake syrup and dig in. Preheat a griddle or large skillet over medium-low heat. 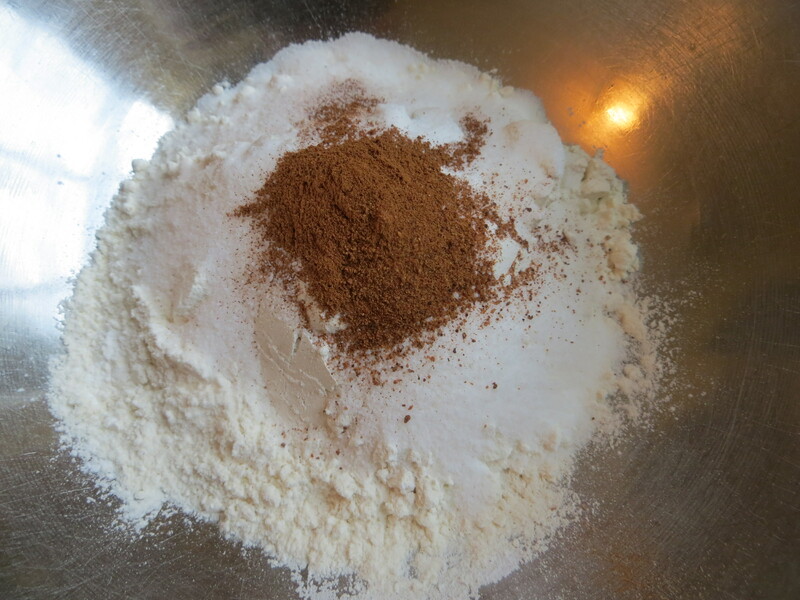 In a large mixing bowl, combine flour, sugar, baking powder, salt, cinnamon, and nutmeg. Whisk together to combine. In a medium-sized bowl, combine the egg, milk, and pumpkin puree. Mix well to combine. Pour the wet ingredients into the dry ingredients and gently mix together until the batter is just combined. Stir in the vanilla and butter. Grease the griddle or skillet with non-stick cooking spray. Portion out ¼ cup servings of batter onto the skillet – sprinkle in mini-chocolate chips if desired. Cook pancakes for 2-3 minutes per side, or until they are golden brown. Serve immediately with warm syrup. Slightly adapted from Martha Stewart.